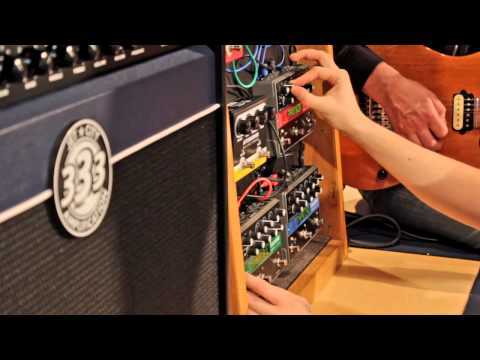 Multi Eventide stompbox demo jam freakout! The results of an improvised mess-about tweaking all our in-house Eventide Stompboxes, sometimes all at once. The chain is Suhr Guitar into Eventide ModFactor fed into TimeFactor, then into Pitchfactor, then into a Jet City 50 Watt 2 x 12 Combo amp. Guitar is provided by Source’s resident shredder Ian Iredale, knob twiddling by Alex. You can hopefully get an idea for the sheer range of ideas, sounds and general all round genius these particular pedals provide. Eventide stompboxes are as much studio effects as they are guitar effects (all are stereo, with selectable Line/Guitar input/output volumes), all sound completely fabulous and are easy to use, but still super super deep. Mic setup is Shure SM57 on the cone going into a UA 610, RØDE NTG1000 on the rear of the cab, RØDE NTG2 to pick up our voices, all fed into a PreSonus FireStudio Mobile for conversion. Author AxemanPosted on April 15, 2011 Categories GuitarsTags Audio, chords, demo, distort, Echo, Effect, effects, Electric Guitar, Eventide, example, fingerpicking, Guitar, how-to, modfactor, modulate, Music, musical instruments, pedal, Pitch, pitchfactor, process, processing, review, Rock, Solo, sound, Space, stompbox, synth, synthesized music, Synthesizer, Techno, timefactorLeave a comment on Multi Eventide stompbox demo jam freakout! This video takes a quick look at the Sonoma Wire Works Guitarjack – a device for connecting your guitar to your iPhone or iPod touch. www.worldmusicsupply.com Jason Spencer from World Music Supply demonstrates the AW-3 Dynamic Wah effects pedal from Boss. www.worldmusicsupply.com Jason Spencer of World Music Supply demonstrates the OS2 Overdrive/Distortion effects pedal from Boss for electric guitar. www.worldmusicsupply.com A demonstration of Boss’ Fuzz FZ-5 guitar effect pedal from Jason Spencer of World Music Supply. www.worldmusicsupply.com Jason Spencer from World Music Supply demonstrates the OD3 OverDrive effects pedal from Boss for electric guitar. www.worldmusicsupply.com Jason D. Spencer of World Music Supply demonstrates the Boss Metal Core ML-2 Distortion Pedal for electric guitar.